Iraq deployed troops Saturday to monitor an oil well seized by Iranian forces along the disputed border between the two countries, an Iraqi official said, as Baghdad demanded once again that Iran withdraw. The diplomatic standoff began late Thursday, when Iranian forces reportedly crossed into Iraq and seized the well, which sits just over the border in the southern Maysan province. It was a dramatic display of the occasionally tense relations between the wary neighbors. Iraqi troops escorted workers back to a remote oil well Sunday after Iranian forces withdrew as a standoff on the two countries’ disputed border appeared to wane. Two Iraqi government officials and an employee at the site said about 11 oil workers returned to well No. 4 at the al-Fakkah oil field, seized by Iranian forces on Thursday. Al-Fakkah is one of the largest oil fields in Iraq, and is located in the southern province of Maysan. U.S. lawmakers called on the White House to quickly fill vacant cybersecurity posts in the wake of revelations that Iraqi insurgents have learned to intercept video feeds from unmanned military drones. Lawmakers also expressed frustration that no action was taken until this year, even though the vulnerability of the video feeds had been known since the 1990s. The story was first reported Thursday by The Wall Street Journal. back from the six-year war. in Iraq will total about 120,000 over the next month. now — about the size of an Army brigade. 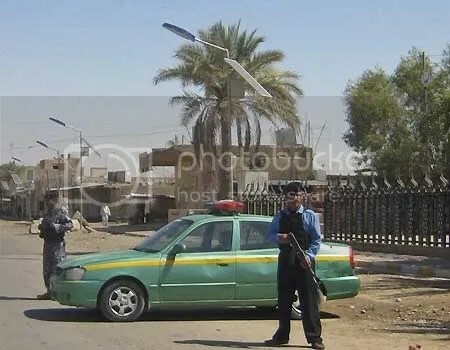 Sept. 24: Iraqi police stand guard at a checkpoint in Tikrit, 80 miles north of Baghdad, Iraq. Five Al Qaeda-linked prisoners awaiting execution and 11 other inmates broke out of a prison in Saddam Hussein’s hometown of Tikrit, prompting a massive manhunt Thursday, officials said. unannounced mission to help the country resolve its differences ahead of America’s military withdrawal. The shells were heard as they were fired from across the river on the east bank of the Tigris and at least one explosion was audible. There was no immediate word on any casualties or damage in the Green Zone or in any other areas of the capital. to government offices, the U.S. and British embassies and parliament.